So many large fashion retail brands are doing away with their Australian design teams and sending buyers to overseas suppliers to source their collections (many of which are unfortunately imitations of original designs - for which the designers receive nothing). For this reason, I fully support Target's initiative to work directly with designers to bring their original designs to the mass market. The designers are compensated correctly, and we all get to benefit from affordable design in the marketplace. The latest two Australian designers to collaborate with Target are bringing fun collections to the market for kids. 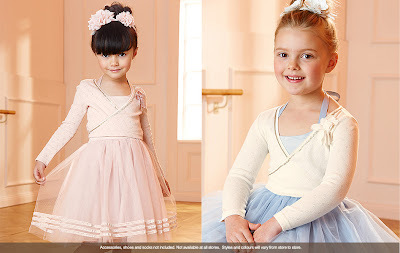 The first, launching on 21st November 2012, is Collette Dinnigan for the Australian Ballet's ever-so-sweet line of ballet-inspired pieces for little girls. Created to celebrate the Australian Ballet's 50th anniversary, the collection includes tutus, dresses, skirts, tops, long-sleeved wraps and sequined bolero. Now wouldn't you rather have your little one dress up in these than in Disney Princess polyester? For more images, check the Target website. Ten percent of the retail price of every item sold will be donated to support The Australian Ballet's education programs. The collection will be available at select Target stores and online. The second offering comes from cult jeans and street wear label Ksubi who have designed a more urban range for both boys and girls. The collection includes signature denim jeans, shorts, hoodies, tees, dresses and jumpsuits. It's fun, bright and playful and I can't wait to see more images of what's in store. Ksubi Kids for Target launches nationally in selected Target stores and online on 1st December, 2012.